This 75 Watt (maximum) magnetic base light holds firmly to most any machine. The light has three fully functional joints for complete maneuverability and adjustability, plus a fourth joint that rotates the lamp head a full 360°. It has a 5 ft. long cord and plug. Light bulb is not included in the package. This is a serious shop lamp. Good lighting is one of the most under-appreciated assets for fine woodworking, especially handwork at the bench. It is a shame to see an elaborately equipped shop with nothing more than fluorescent ceiling lights illuminating the workbench. Basically, the properties of lighting are intensity, distance from source to the object, angle of incidence, and quality, which includes the color cast (color temperature). The Super Nova Lamp from Woodturners Wonders delivers big time on all counts. 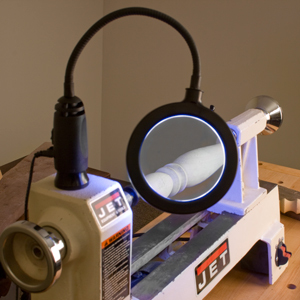 Developed by woodturner – inventive guy Ken Rizza for use with a lathe, but this lamp is just as useful for general woodworking. 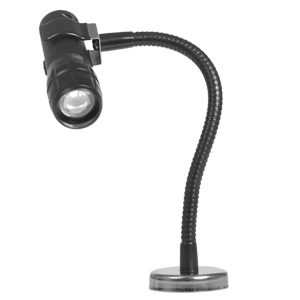 The three LEDs in the lamp head together use 9 watts of power to generate 870 lumens. This is a heavy-duty lamp. The 30" flexible stainless steel neck, covered with a black flexible, non-reflective shroud, holds its adjustment in any position. This is the key to the effectiveness of a lamp like this – the light can be adjusted to the exact location and direction desired and it stays put. The heavy rectangular base houses a switchable magnet that holds with 286 pounds of force! The base is large enough to easily accommodate a clamp to secure it to a wooden surface. The base holds unyieldingly to 2mm sheet steel bandsaw cover, while the neck does not sag a bit when fully extended. Wow! 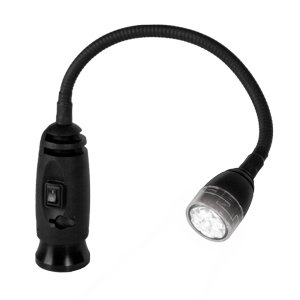 Get ultra bright light right where you need with the Woodturner's Magnetic Base LED Work Lamp. The switchable magnetic base allows you to mount it nearly anywhere on your lathe while ensuring it won't vibrate loose while turning. This High intensity Lamp was made to Wood Turners Specifications. It was well thought out and there is no better at any cost. Switchable magnetic base has 110 lbs of pull and won't vibrate loose while turning. 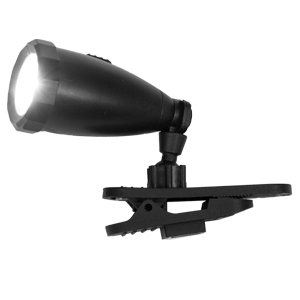 Heavy-duty flexible neck is approximately 30-1/2" from end-to-end and allows you to position light right where you need it. Curved base plate allows you to mount on top of tailstock. Thick plastic lens protects light from chips and debris. Neutral white light with 170 lumens and 60 degree angle. 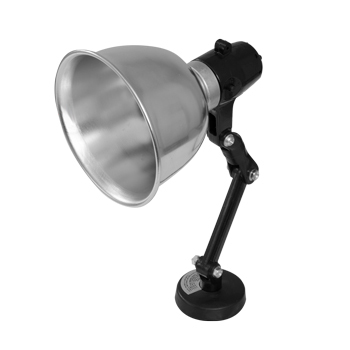 Super Bright Light with 40 lb magnetic base and 8" flex Arm. 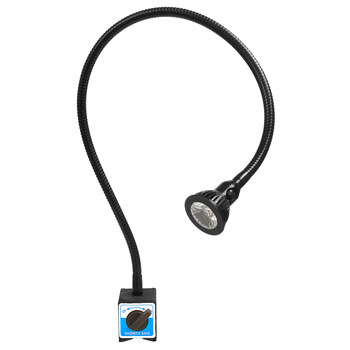 Light Body easily detaches from flex arm to use as a flash light. This LED Work Light has dual power - 110V (included) or 2 each AAA batteries (not included) , magnetic base will firmly attach to any ferrous metal surface, plus the LED Work Light can be clamped to other work surfaces with the supplied C-Clamp Holder ( 2-1/2" maximum clamp opening) When use with 2 each AAA batteries (not included) this LED Work Light makes a great emergency light for your car or truck and easily fits in most glove boxes. 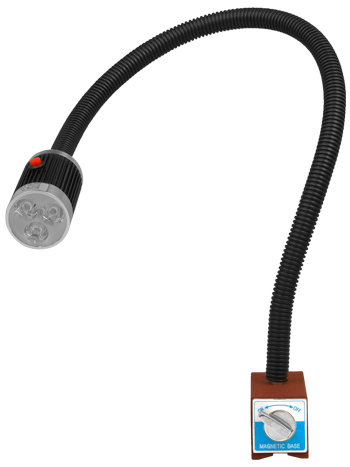 This LED Work Light with 4" diameter 3x magnifying lens has all the bells and whistles, dual power - 110V (included) or 2 each AAA batteries (not included) , magnetic base will firmly attach to any ferrous metal surface, plus the LED Work Light can be clamped to other work surfaces with the supplied Table-Clamp Holder ( 2-1/2" maximum clamp opening) The steel flat top of Table Clamp Holder allows for quick magnetic attachment to the Table Clamp Holder and also doubles as a easy way to store the LED Work Light attached to a shelf or other surface. 110VPower Cord with transformer included. 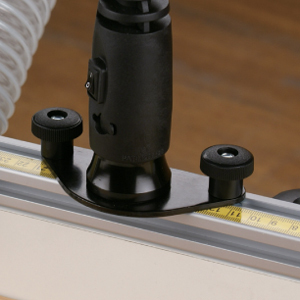 Non-Ferrous Metal - Mount to your work bench or other non_ferrous table tops using the (Included Table-Clamp). Ferrous Metals - Magnetic base attaches firmly to any ferrous metal surface. Small but puts out a lot of light. In the shop the magnetic mount is the true usefulness of this light. Since it is so small you can stick it in close to were you need to see on most any machine.The alligator clip will attach the light to a hat brim to shine light were ever you look or to the sun visor of you car as a map light. Too many uses to even list. Clips on hat brim for hands free lighting, perfect for working with small items. Magnetic clip makes for easy attachment to shop machines, bandsaw, drill press, ect. Have you ever needed just a little more light over your router bit, or even your tablesaw blade, but you have no way of securing a light to your fence? Now you can with our easy to install T-track plates for our Magnetic LED lights (not included). Simply mount the plate to the top of your track on your fence (with a track or t-slot installed), then your are able to place the Magnetic LED Light (not included) directly onto the plate and adjust the position of plate and light accordingly. The light can easily be removed when it is not in use or not needed. The plates are available in two different sizes according to your specific Track or T-slot size.